Qatari / Swiss manufacturer Burrda needed to come up with something unique for a Belgian team who has a good chance to surprise the football world with a deep run in this year's FIFA World Cup. The small company managed to provide the "Red Devils" with an original look with the use of silhouettes and various line designs. 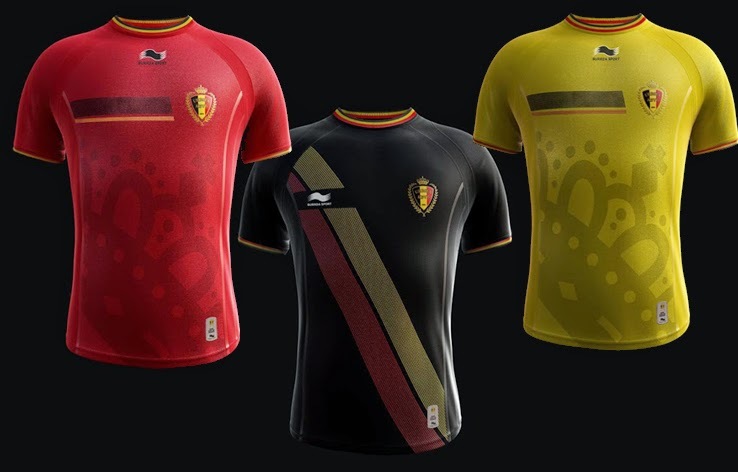 The home shirt is a classic Belgium red, and the away is a black, a color which Belgium used as an alternate a few times in the early 2000's. But the real surprise coming from Burrda is the yellow third jersey. A third shirt is never really needed for a World Cup squad, but Burrda's bold move to create it anyway and in a yellow color which has never been previously used by the Belgian national team, could be a good idea as their contract with the Belgian association runs out at the completion of the World Cup. With Russia and Korea Rep. also wearing red as their primary colors, don't discount the yellow shirts from making an appearance. Another boring design by Puma completes the manufacturer's lineup of mostly mediocre World Cup kits. 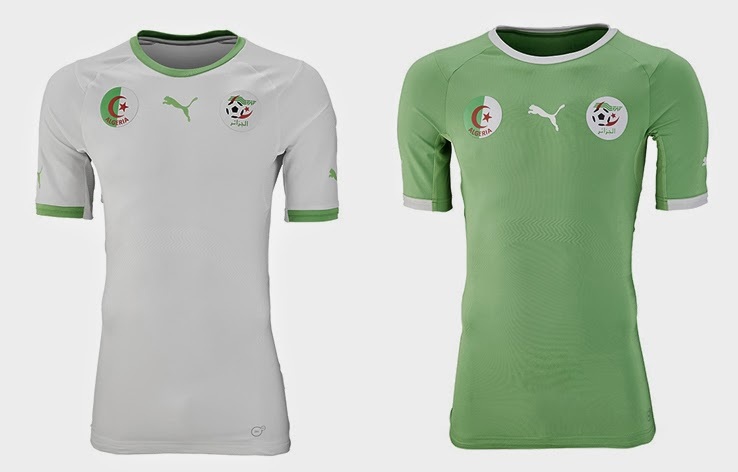 Algeria's likely early exit from the competition seems to have given the designer at Puma a pass on any creative work for these shirts. Basically, there is no detail work on these at all. I've seen simple designs that are enhanced by a small detail, a unique contrast color or an interesting collar, but this design managed to incorporate none of those. Total failure for Puma yet again. 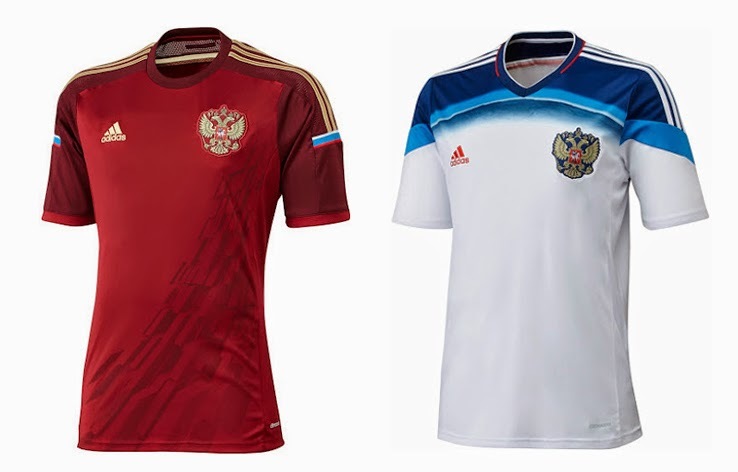 Adidas (unlike Puma above) managed yet again to create something country-specific, this time for the Russian team. Going back to the dark red color for the home shirt, the design balances perfectly with the gold trim. Perhaps the background design is a bit odd, especially for the fact that it is really unclear what it represents, but overall this shirt has a nice solid look about it. For the away, Adidas chose to go with the white and blue almost retro kind of look for the Russian national squad, with the collar trim and manufacturer's logo completing the Russian flag colors with a red. 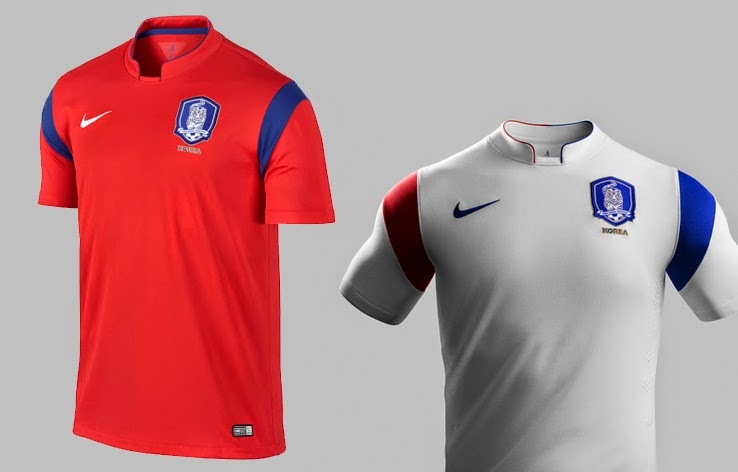 Since Nike took over the manufacturing of Korean national team kits from Korean company Rapido in 1995, they probably managed to make one unique edition of the shirts, that was for World Cup 2002. This time again, the designers at the world leading sports manufacturer could not come up with anything interesting for the Korean team to wear at a major competition. While the collar detail on both the home and away jerseys, and the different shoulder coloring on the white shirt are interesting features, the rest of the kits' design is quite dull.